Mix all the marinade ingredients well in a bowl together. Dice the chicken into largish chunks & toss into the bowl coating well. Cover, refrigerate & allow to marinate for at least 30 minutes or as long as you can spare on the day. Soak 4 wooden skewers in a large baking tray of water, this stops them from burning whilst cooking. 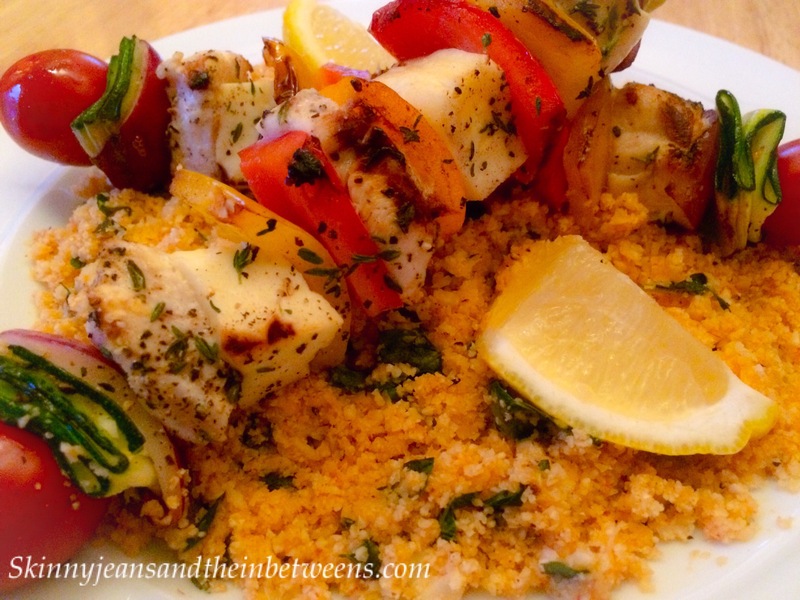 Chop all the skewer vegetables except the courgette into equally sized medium chunks. Slice the courgette lengtwise with a vegetable peeler. Arrange the chicken, halloumi & veg chunks onto the soaked skewers & concertina the courgette into a fab shape before skewering onto 4 skewers. You should get approximately 3 medium chicken chunks & 2 medium halloumi chunks per skewer depending on the size you’ve cut them. Sprinkle over some more thyme & black pepper & set aside covered & refrigerated until ready to grill. Heat a large griddle pan & spray it with oil. Grill the skewers for 15 to 20 minutes turning occasionally or until the chicken is cooked & the halloumi is roasted (If you’re not familiar with halloumi you can grill this cheese it doesn’t melt & holds its shape) Meanwhile place the washed chopped cauliflower florets into a food processor (you may need to do this in batches) pulse until fine like couscous. Heat another pan & spray with oil. 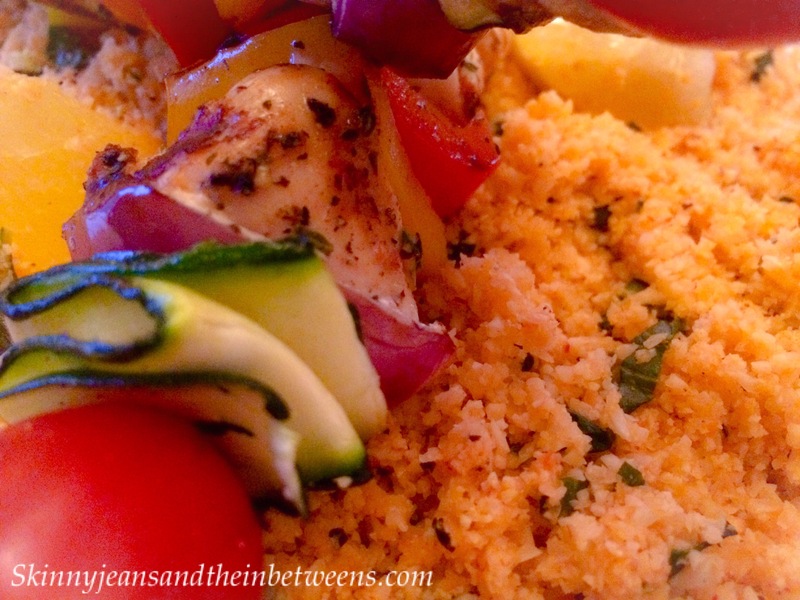 Gently fry the cauliflower cous cous for 5 to 8 minutes until heated through & add the harissa & the juice of a lemon (as much as desired to moisten & flavour the couscous, add half & if still a bit dry add more) Mix well over the heat for a few minutes & add the chopped basil just before serving. 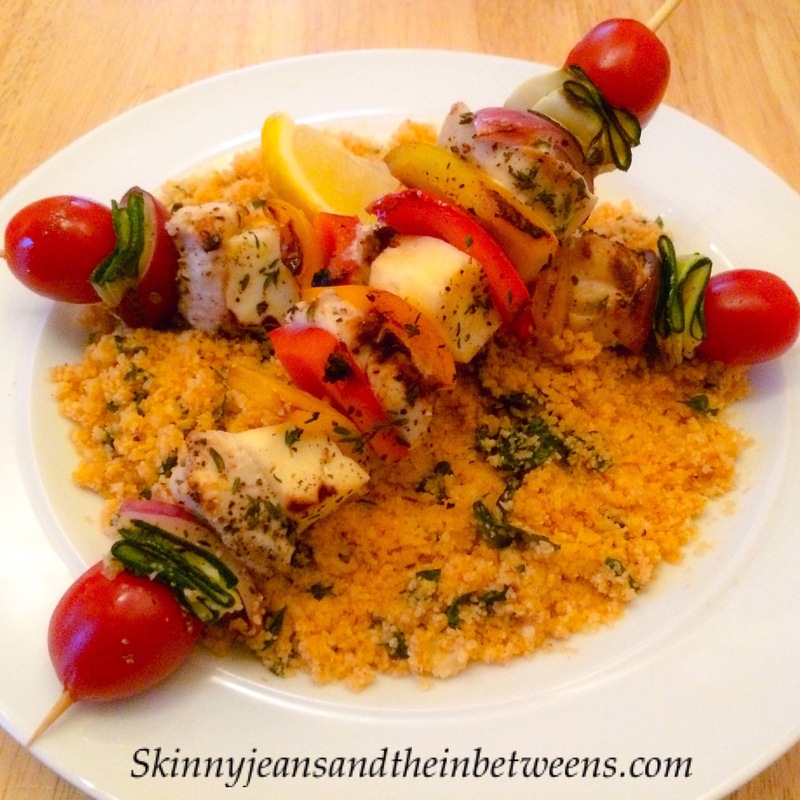 Plate up the couscous & top with two skewers per person, add a lemon quarter for garnish/squeezing over & Enjoy!